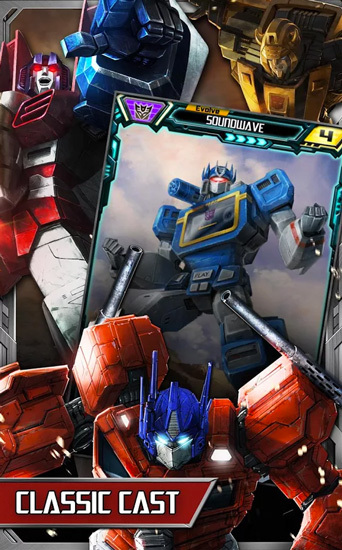 Transformers Legends is an intriguing card-collecting game from Mobage, Inc., featuring the world’s most popular transforming robots. By collecting cards and building teams, you can fight against the game’s enemies and collect rewards in the form of more powerful character cards and weapons cards. Gameplay is pretty simple; through a series of “battles,” (which is mostly your cards automatically battling the game’s cards) you earn points and credits, which you can use to upgrade your cards with weapons, or to win or purchase new cards. The more powerful your team, the bigger the enemies you can defeat, and the more powerful cards you can earn. 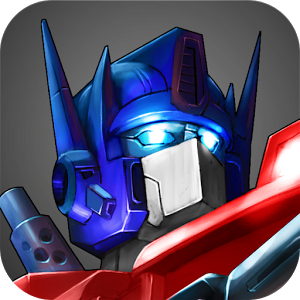 The graphics and artwork in the game are terrific, and it features a wide range of Transformers characters. Unfortunately, most of the time, those characters are very obscure later generation Transformers. It’s all too infrequent that you see big guns like Optimus Prime or Megatron pop up. And while the game is certainly addictive (I’ve spent many times a day just clicking the same buttons over and over again to upgrade my team), the problem with it comes in the long term. I’ve now built my team up so powerfully that none of the mission rewards offered are worth it for me, as they’re not as powerful as the cards I already have. Thus, there’s not much incentive to play the missions, as the only way I can get more powerful cards than I have is to spend money. All that said, Transformers Legends is still a fun time waster for fans of the franchise. If you like strategy games that aren’t too challenging, check this one out.